Hope you had a fabulous Christmas Day! This week's project for Ann's fab team looks a little bit forward as it not only uses the required Message in a Bottle stamp set but it also uses some DSP from the brand new Spring/Summer Stampin' Up! catalogue for 2018 which can be ordered from in early January. To make this cute card which is great to tell someone you love them anytime but could be perfect for Valentine's Day I used a gorgeous bubble type DSP which is shimmery and embossed to give some relief to the project. The DSP is from the Myths and Magic stack which is so gorgeous it's not even possible to describe. It's a very simple card as I made it on Christmas Eve and really wanted to get it all blogged and shared so that Christmas Day could be craft free, it's been an absolute whirlwind of crafting up to this point and so it's time to lay that bone folder and the Tombow down. I started with a Whisper White base measuring 8 x 4.5 inches and scored at 4 on the long side. Then I added a layer of the DSP which measured three and seven eighths of an inch by four and three eighths of an inch. I then added a layer of Whisper White to this which measured 4 by 3.5 inches. 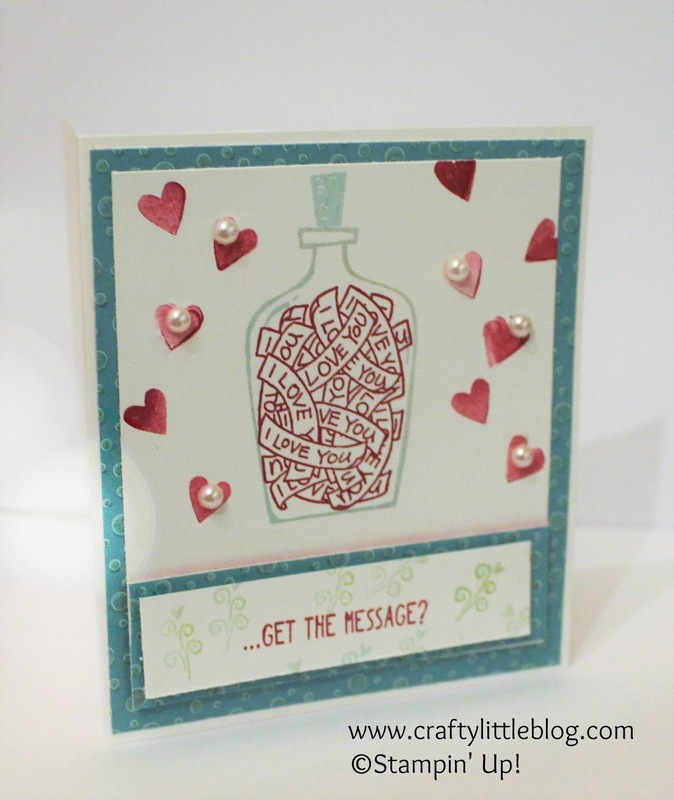 On this I stamped the bottle and cork using soft sky and using Berry Burst I stamped the I love you notes inside the bottle to add a pop of contrasting colour. I also used the small heart stamp from the set and using stamping off and direct stamping I added hearts falling down either side of the bottle. I wanted to make them look like tissue hearts... with a bit of practice I might actually be able to make that happen. I messed up a couple and didn't want to start over, Christmas Eve was ticking down, and so I just popped some pearls onto the worst mistakes. I'd planned to dot on some pearls anyway to reflect the sea life theme. To finish off I used dimensionals to add a strip of the DSP measuring 1 inch by 3.5 inches and then a piece of Whisper White measuring a quarter inch less all around stamped with the Get The Message stamp in Berry Burst with a flurry of heart and swirl stamps in Soft Sky. Hope you like it, be sure to drop in for the last in the series next week and enjoy the rest of the festive season.